Iceland’s Eyjafjallajökull Volcano produced its second major ash plume of 2010 beginning on May 7. When the first ash eruption began on April 14, air travel across most of Europe was shut down, but by the time of the second eruption, forecasters were better prepared to predict the spread of volcanic ash. Despite some airport closures and flight cancellations, most air passengers completed their journeys with minimal delay. Among the key pieces of information that a computer model must have to predict the spread of ash is when the eruption happened, how much ash was ejected, and how high the plume got. 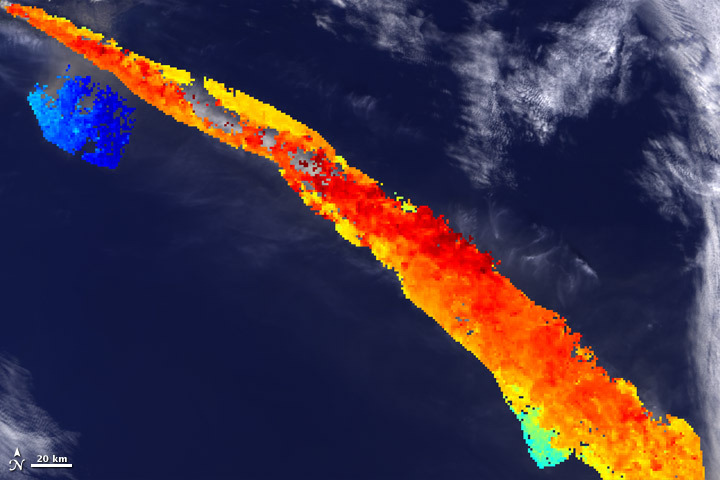 The Multi-angle Imaging SpectroRadiometer (MISR) aboard NASA’s Terra satellite collected data on ash height when it passed just east of the Eyjafjallajökull Volcano mid-morning on May 7. MISR has nine different cameras, each viewing the scene below from a difference angle nearly simultaneously. By combining all these images using a hyper-stereo technique, scientists can calculate the height of the ash plume. The top image is a natural-color, nadir (downwards-looking) view of the scene, with the volcano itself just off the upper left corner of the image, and the main plume extending to the southeast. The bottom image is the stereo-derived plume height. Each pixel in the image shows an area 1.1 kilometers (0.68 miles) wide. The vertical accuracy is about half a kilometer (0.3 mile). 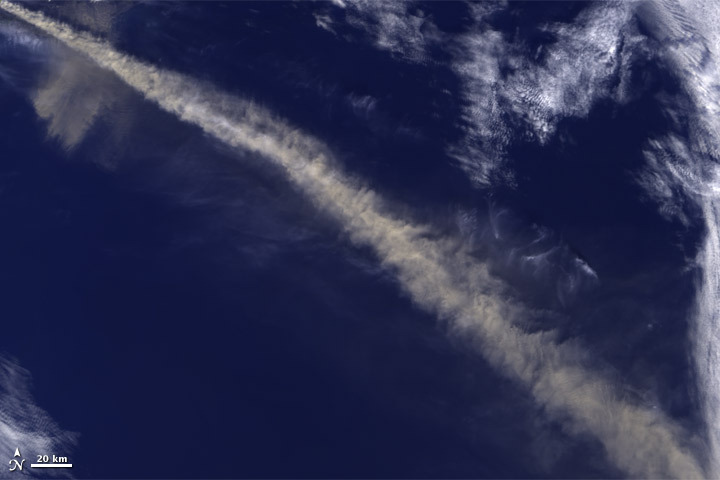 Much of the plume resides between 4 and 6 kilometers (2.5 and 4 miles) above the ocean surface (orange and red color in the right image), but the ash descends to near 3 kilometers (2 miles) (yellow-green) far downwind. Note also the smaller patch of ash, within about 1 kilometer (0.6 mile) of the surface (blue), which appears to be traveling to the southwest. This ash was on the ground and was then resuspended by low-level winds. The Terra satellite is in a polar orbit, crossing the equator on the day side at about 10:30 a.m. With MISR’s 400-kilometer-wide swath, it images the entire Earth about once per week, every two to four days at higher latitudes. 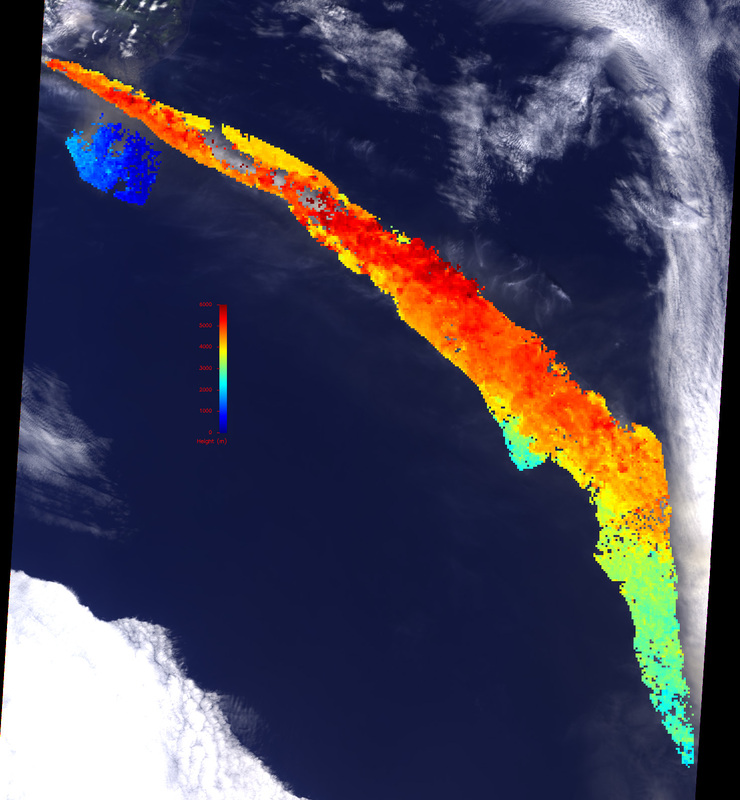 Another instrument on Terra, the Moderate Resolution Imaging Spectroradiometer (MODIS), has a single viewing perspective, but a 2,300-km-wide swath, offering complementary, daily coverage of the volcanic plumes. The combination of MODIS area coverage and MISR plume height maps provides among the best constraints for ash plume modeling. These data are being used in continuing studies of the Eyjafjallajökull ash plume. NASA image courtesy GSFC/LaRC/JPL MISR Team. Caption by Ralph Kahn and the MISR Team. 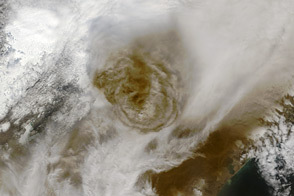 NASA satellite measurements show the height of the Eyjafjallajökull ash plume on May 7, 2010.